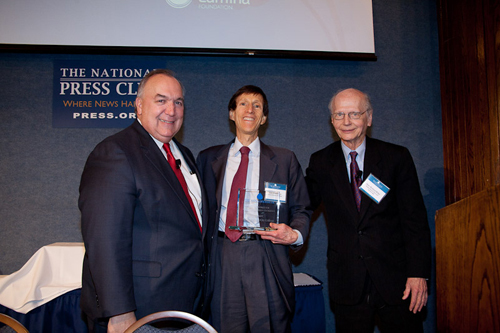 SBCC Acting Superintendent/President Dr. Jack Friedlander (center) accepts the Aspen Institute College Excellence Program award as a top 10 finalist from John Engler (left), former Michigan Governor and Co-Chair of the Aspen Prize Jury, and Richard Riley (right), former U.S. Secretary of Education, former South Carolina Governor, and Co-Chair of the Aspen Prize Jury. This honor was validation of SBCC’s reputation in the state – and now the entire nation – as a premier community college committed to excellence and innovation. At this luncheon, a number of distinguished speakers addressed the audience including Dr. Jill Biden, wife of U.S. Vice President Joe Biden and a longtime educator, Arne Duncan, U.S. Department of Education Secretary, and Richard Riley, former U.S. Department of Education Secretary. The messages were loud and clear. The community college system will be a key player in reviving the country’s economy and educating a workforce to meet the demand for the evolving and highly competitive jobs of the 21st century. By 2018, more than 60 percent of American jobs will require some type of post-secondary qualifications. For millions of Americans, nearly half of the entire country’s undergraduate student population, community colleges provide an essential pathway to well-paying jobs and transfer to four-year colleges and universities. With four-year colleges’ and universities’ tuitions escalating at over twice the rate of inflation, community colleges serve as the most affordable option in higher education. The Aspen Institute spent over a year researching the top community colleges in the nation that are distinctive because they deliver high levels of success for their students. In Washington, I was pleased to learn that SBCC, along with the other nine finalists, are all focusing on best practices that improve our capacities to achieve high levels of student learning, transfer, graduation, and post-graduation success in today’s labor markets. 1. Basic Skills – SBCC received a significant federal grant last year to develop a new program to increase and accelerate student completion of basic college skills in two years or less. The Express to Success Program (ESP) launched this fall with over 250 “at-risk” students. Eighty percent of all ESP students successfully passed the English and math courses in which they were enrolled, and 70 percent passed two English or two math classes in one semester. These completion rates are substantially higher than those of non-ESP students enrolled in other sections of the same classes. We plan to expand this program to serve those students who are committed to completing their required math and English courses more quickly so that they can achieve their degree and/or transfer goals in the most expedient manner as possible. 2. Transfer – The college is re-doubling its commitment to increase the number of its students who successfully transfer to a four-year college or university. Before year-end, SBCC will have signed up to 20 more additional guaranteed transfer and articulation agreements with both in-state and out-of-state colleges and universities In addition, another significant federal grant awarded to the college this year is being used to develop the Express to Transfer Program for STEM (Science, Technology, Engineering and Math) majors. This accelerated program, similar in concept to the Express to Success Program, will move these students through their SBCC coursework in no more than two years after which they will transfer to a four-year college or university in a STEM major. Express to Transfer for STEM majors is scheduled to get under way in Fall 2012 and will be expanded to nearly all majors in Fall 2013. 3. Career Technical/General Education Task Forces – SBCC will be establishing task forces to identify the skills our graduates must acquire to successfully compete for the jobs that will be needed in the 21st century marketplace. 4. Engaged and Well-Informed Citizenry – Our students need more than just basic skills and training. The college is increasing its efforts to encourage students to become involved in a variety of co-curricular activities that allow them to learn more about our community, society, government, and world affairs. 5. Continuing Education (non-credit) – With shrinking resources, the state has made clear that community college funding needs to shift away from non-credit lifelong learning and personal enrichment courses to ones that prepare students for employment and/or to complete their certificates, degree and/or transfer objectives. SBCC remains committed to offering a robust Continuing Education (CE) program to serve the learning needs for all students. We are currently completing membership for a task force to identify a comprehensive CE program through a combination of state-supported classes, fee-based classes, and classes and learning experiences supported by external donations. One of the task force’s objectives is develop a proposal to establish the Center for Lifelong Learning to offer lifelong courses and programs that cannot be funded by the state. The center would be a self-supporting entrepreneurial program within the college. In Washington, the other finalists and I agreed that our colleges would stay in touch with updates on our various activities. The next step of the Aspen Institute College Excellence Program calls for compiling and disseminating best practices from all the top 10 colleges to the nearly 1,200 accredited, public community colleges nationwide. As Acting Superintendent/President, I am proud of the leadership role that SBCC is taking to address the challenges our nation is facing and helping all students who come to community colleges achieve both their educational and lifelong goals. Dr. Jack Friedlander is Santa Barbara City College Acting Superintendent/President.